The retrospective exhibition Ai Weiwei: According to What? opens today at the Art Gallery of Ontario in Toronto, Canada. 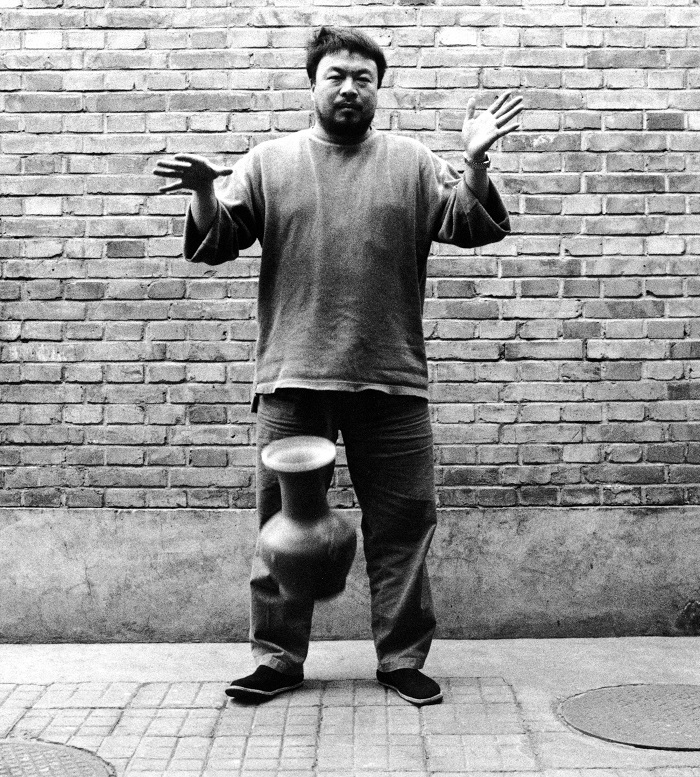 Ai Weiwei (born 1957) is China’s most famous – or infamous – depending on your weltanschauung – contemporary artist. 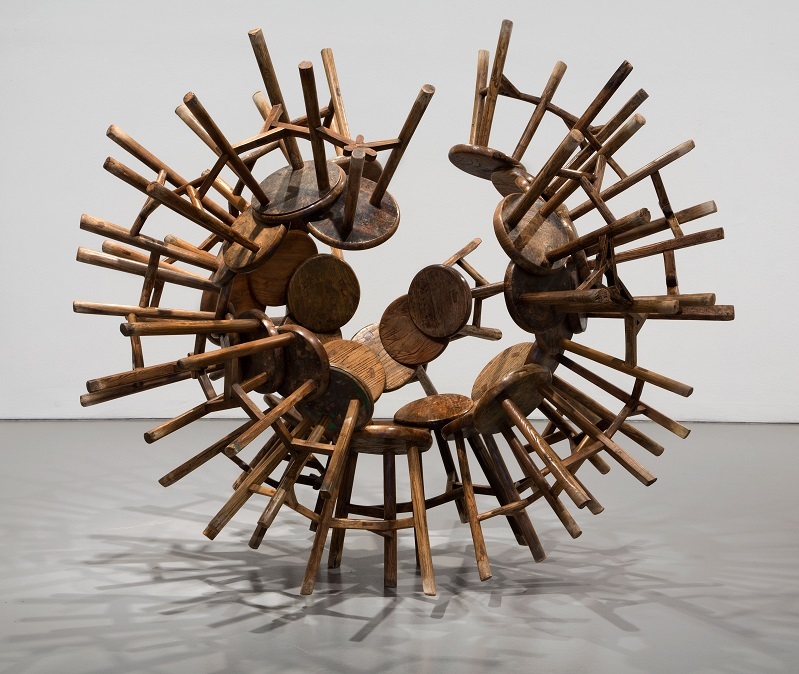 Currently without a passport and not permitted to leave China, Ai Weiwei has, with a team of energetic workers, fashioned bold sculptures from humble stools, bicycles, firewood, compacted tea leaves – even rusty lengths of rebar. Whether he is letting drop and smash a Han dynasty urn, or starring, with shaved head and red rosebud lips, in the “music video” Dumbass – about his 2011 jail experience – Ai Weiwei provokes us and respects our intelligence. How tall is this wall? The clouds, wind, rain, and sunshine of the heavens? The currents of water and air? Whose thoughts are freer than the wind? Whose will is more entrenched than the earth? Whose wishes are more infinite than time? Each standing alone and erect. And swam in the sea. And buried you in the silt. And you still look alive. You have no reaction to the world. You cannot hear the sound of the waves. We should use our energy to the fullest. How long have you been silenced? Have you perished in this deep rancour and bitterness? Please, give me a light, give me a light. 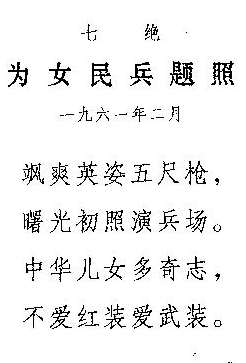 Liǎng bìn cāngcāng shí zhǐ hēi. Mài tàn dé qián hé suǒ yíng? Shēn shàng yīshang kǒu zhōng shí. Xīn yōu tàn jiàn yuàn tiān hán. Xiǎo jià tàn chē niǎn bīng zhé. 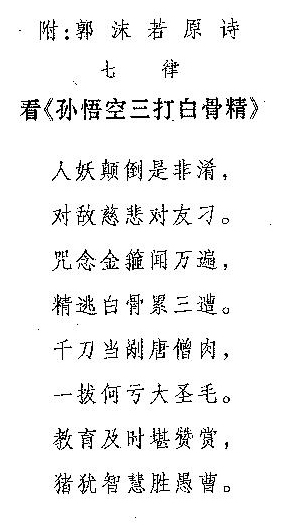 Shì nán mén wài ní zhōng xiē. 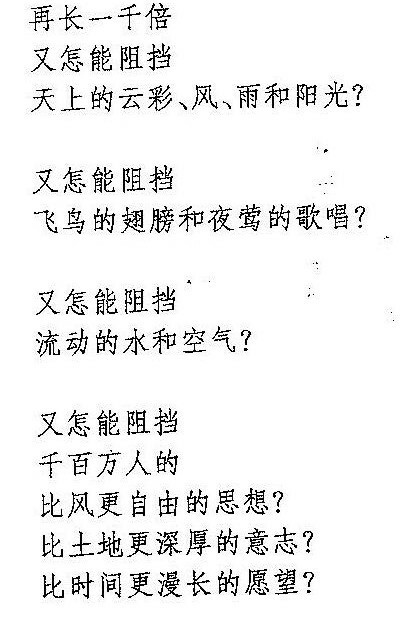 Piānpiān liǎng jì lái shì shuí? 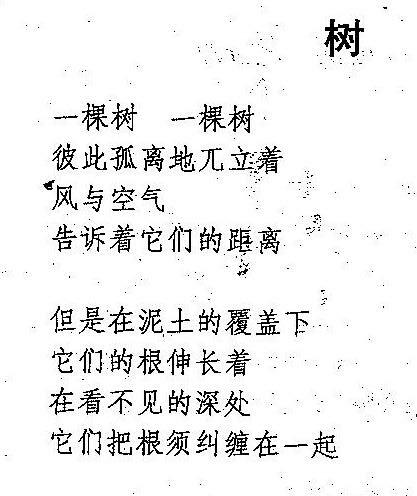 Huǎng yī shǐzhě bái shān ér. 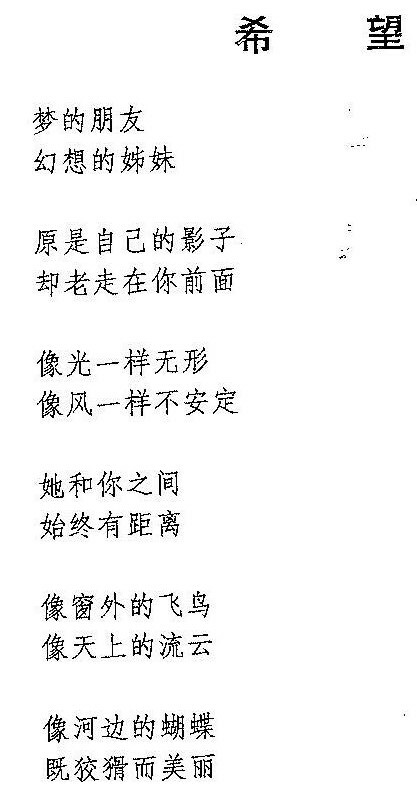 Huí chē chì niú qiān xiàng běi. 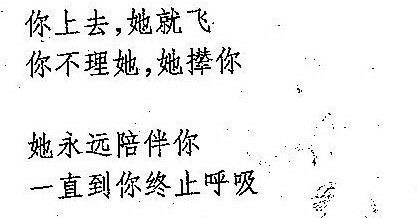 Gōngshǐ qū jiāng xī bù dé. Jì xiàng niú tóu chōng tàn zhí. peddling charcoal to get money – and what does it go for? Clothes for the body, food for the mouth. he worries how much his coal will bring, praying for cold weather. at dawn he sets off in his cart, wheels crunching over frozen ruts. they rest in the mud by the market’s south gate. And who are these two horsemen arrogantly galloping by? Yellow-robed palace attendant with his white-shirted lackey. he turns the cart around, shouts at the ox, heads off north. but when palace attendants whisk it away, what good are regrets? – this their “full payment” for the charcoal! Posted: January 23, 2012 | Author: Zócalo Poets | Filed under: Chinese (Mandarin), English | Comments Off on The New Year…and Crows! with Mao Zedong’s poem “New Year’s Day”. The Chairs Sit out in the Winter . . .
magpies tidying away small coins. The wind’s weaving loom weaves the surroundings. also sits out in the winter. Just as it was that winter . . .
. . . I love you. the oratorical and inspirational toward the private – and the obscure. Western and Chinese worldviews, and distributed his poems via photocopies. 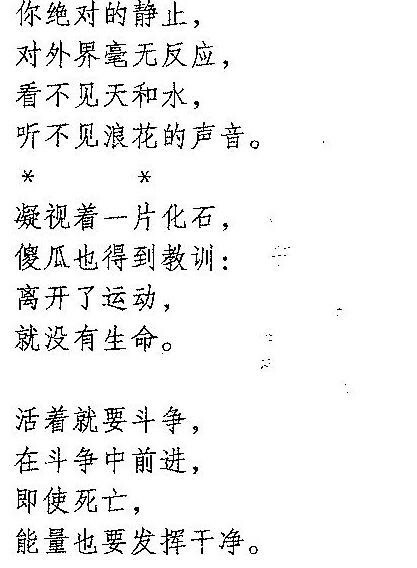 something that both widened and strengthened his Chinese-language poetry. And mayflies lightly plot to topple the giant tree. And the arrows are flying, twanging. Seize the day, seize the hour ! The Five Continents are rocking, wind and thunder roaring. Away with all the pests ! None or few the unfallen flowers. Yet earth’s gentle breath grows warm. And wild bears never daunt the brave. Small wonder flies freeze and perish. the first gleams of day. The monk was kind to foes and vicious to friends. And thrice he let the White Bone Demon escape. Plucking a hair means nothing to the wonder-worker. Even the pig grew wiser than the fools.